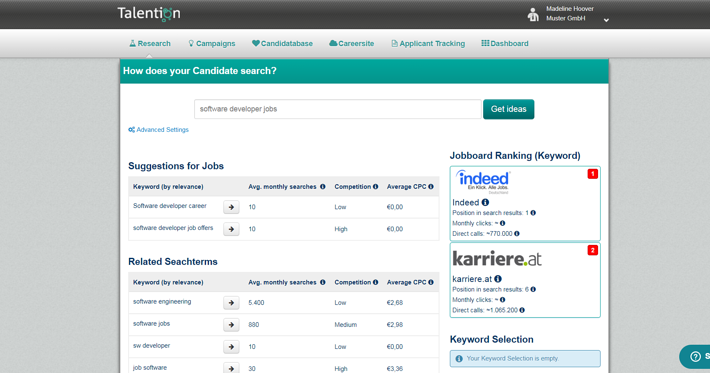 By utilizing the black box method, your job ad will be displayed on a huge number of job boards with just one click. This process sounds promising at first. However, you can't track which job sites the job ad is shown on. It is important to know where the qualitative applications are coming from. You shouldn't blindly post on multiple job boards, but rather analyze the success of each channel. Evaluating the channels where you are posting jobs is the only way to know which channels have brought qualitative applicants and are worthwhile for future recruitment. If you don't evaluate the channels, you won't have an understanding of which channels are working for which target groups and will have to start from scratch with each new position. A common mistake you should try to avoid is to using the wrong keywords. You need to advertise the right job title to reach your desired target group. You should research which job titles your target group is searching for and utilize your findings to create better campaigns. Going alongside of using the right keywords, you should consider the effect of you job postings on your SEO. On one hand, they can help to build up free reach and bring new candidates to your page. On the other hand, if you are posting duplicate content to a lot of irrelevant job boards or aren’t using the right keywords, you could negatively affect your search engine rankings. If you publish your job advertisement on lots of job boards, but your target group does not use those boards, you won’t receive any relevant applications. You should research the job boards that are more relevant for your target group and focus more on those sites. If you discover a new job board that seems relevant, test it out for a week or two and see what kind of results you receive.